In 100 Words: Brilliantly taglined "A Nervous Romance," Annie Hall set a new standard for rendering a hearty, laugh-filled, but ambivalent love affair, ending amid disenchanted hostilities that most romantic comedies, less honest and less funny than this one, strain to tidy up. The film is equally, elegantly "nervous" in shuffling visual and comic idioms: animated inserts, broad sight-gags, entomological long shots, split screens, quick zingers in airless close-up, the inky stasis of Annie's nightclub. Subsequent Allen films made stiff conceits of the light/dark contrasts and stylistic shape-shifting that Annie inhabits with such easy if anxious panache. Gordon Willis is the under-acknowledged MVP. Food for Thought: The temptation is strong for Allen scholars to repeat his best lines or describe his wittiest devices without illuminating much that we don't already sense in the film, precisely because the humor is so rich. 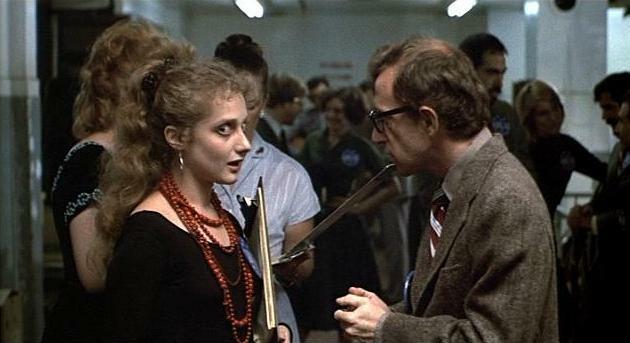 Diane Jacobs, however, offers some especially apt and articulate distillations of what makes Annie Hall and its characters so special, in her mass-market study But We Need the Eggs: The Magic of Woody Allen (St. Martin's, 1982). Peter Cowie combines fannish enthusiasm with some cultural and career-specific context in his short, eponymous monograph about the film (BFI, 1996), reminding us that Allen's first cut of Annie ran almost 45 minutes longer and turned importantly on a murder mystery. Mark Shiel offers some interesting words about the film's presentation of New York in his essay "A Nostalgia for Modernity: New York, Los Angeles, and American Cinema in the 1970s." That piece appears in the anthology he co-edited with Tony Fitzmaurice entitled Screening the City (Verso, 2003), which also features intriguing essays on Menace II Society, The End of Violence, Cronenberg's Crash, Safe, Berlin Alexanderplatz, and the Dekalog cycle, among other movies.